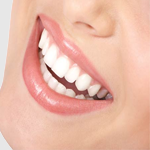 Bonding is a technique similar to veneers. Instead of using a porcelain facing, a tooth-colored filling material (composite resin) is chemically and mechanically bonded to the tooth giving the appearance of straight teeth. A single tooth can be shaped and colored, or your entire smile can be changed!